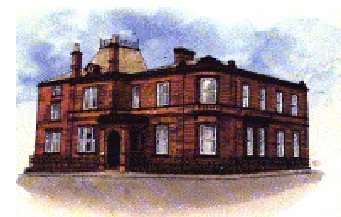 20 years ago I joined the Charlotte Street practice, working in what had previously been the coal cellar of a large sandstone house. My room was dark, with bars on the windows, but spacious. The waiting room was immediately outside my door, but had no windows. 19 years ago we started trying to build new premises, had plans drawn up 4 times, but each hit a hurdle. 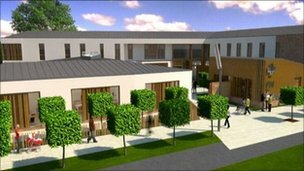 8 years ago a fire made our building unsafe – we were “temporarily” accommodated in Nithbank – the building had originally been a nursing home – a gentleman patient attending my surgery was reminded of the time he scaled the walls to ‘illegally’ enter the first floor room of one of the nurses! I did not need to put a radio on to avoid patients in the waiting room overhearing my conversations, but plumbing was noisy, when hands were washed in the next room I had to abort a chest auscultation, waiting rooms were extremely cramped, and wheelchair access impossible upstairs, and difficult downstairs. We were continually hot-desking, and staff were working in cramped noisy environments, not conducive to accurate and confidential work. The process of building new premises has been long and fraught, endless meetings, negotiations, contracts, delays, moves aborted, then finally 6 months ago we moved to spacious light airy premises. Waiting rooms are big, which has a positive impact on consultations, patients seem more relaxed when they walk, or easily use their wheelchair to access my room. Staff have space to do their work, the whole team is able to meet in one room, the atmosphere is far less fraught than I recall in 20 years. Of course there are snagging problems to be resolved, but on the whole life is better! The time committed to ensuring that the building would work for us was time well spent, the developer has built surgeries before, but they had never built one for us. The practice of medicine has also changed substantially over the last 20 years, the Quality and Outcomes framework (QOF) came in, which aims to ensure the quality of care for patients with chronic diseases, or risk factors. I feel that the QOF has brought more advantages than disadvantages, we have a responsibility to the population of patients as well as to the individual in front of us, and therefore need robust recall systems, and reminders about aspects of care. I disagree with those who suggest that QOF “makes us treat…..”; it does not, the only requirement is to consider appropriateness of a range of evidence based interventions. Unfortunately some of more recent QOF criteria have less of an evidence base; the national enhanced services can be insufficiently sensitive to local issues, and annual contract changes result in change fatigue, frustration and disengagement. These issues need to be worked on, but on the whole I feel the population of Dumfries and Galloway is provided with much more reliable monitoring and management of chronic disease than we managed 20 years ago. In medical education changes have also resulted in difficulties and challenges. 20 years ago doctors in training applied for posts, joined a team, learned from their mentors (who knew them well by the end of their post), but could be exhausted after long hours on call, and might have no structure to their training; we have moved to a situation where EWTD limits the hours our trainees work, undoubtedly safer in terms of inadvertent errors; and trainees enter training programmes which aim to build competences required by a doctor at the end of training. The fragmentation of supervision required to meet EWTD rules makes it difficult for a supervisor to know his/her trainees’ strengths and weaknesses, so structured assessments are required. We are only just getting to grips with the assessments, and acknowledging that to do these well takes time and skill, but when done well can result in a comprehensive assessment, learning and development to ensure that our trained doctors of the future meet the needs of the population. In summary my environment, our service, and our training has improved; but we need to go on working to make the most of our situations to ensure that identified priorities are addressed, and the needs of our patients and trainees are effectively met. However I can do that in a light airy, spacious, comfortable surgery; for the other half of my week I am grateful to Chris Isles for his help in ensuring that the developers understand the needs of OUR new education centre, so in 2017 I will feel comfortable in the new hospital.